There is a reason so many Texas Republicans are mentioning the Democratic president in their commercials: He's unpopular with Republicans, and moderates and some Democrats have their reservations, too. It takes Lt. Gov. David Dewhurst all of three seconds to mention President Obama in his recent campaign ad. That is faster than the 17 seconds it took him in a previous spot; maybe the lieutenant governor was feeling the heat from one of his rivals in his re-election campaign, state Sen. Dan Patrick, R-Houston, who trumpets his efforts “FIGHTING OBAMA” five seconds into the ad he released in early October. These are just a few of the many examples one should expect in the Republican primary: The constant invocation of a candidate’s anti-Obama bona fides is a familiar refrain for preaching to the Republican primary choir, and a tried-and-true strategy heading into a mid-term election year that is sure to see lower Democratic turnout than in the last two presidential election years with Obama at the top of the ticket. 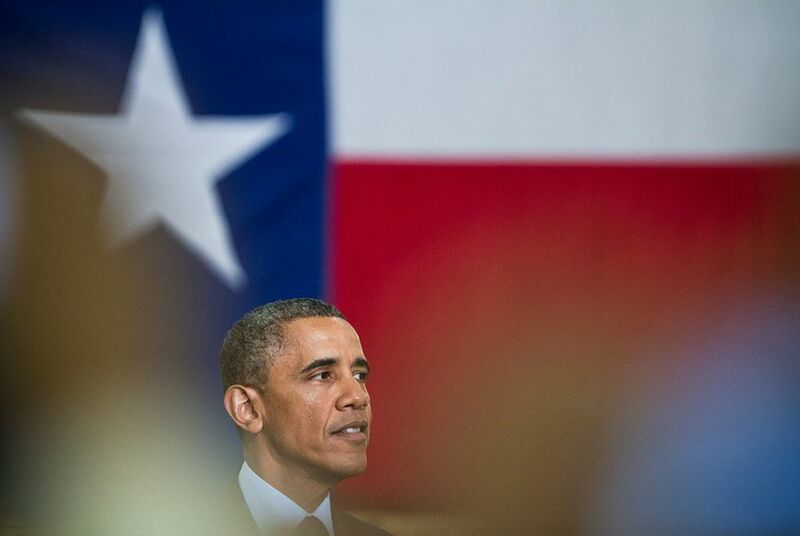 Results from five years of University of Texas/Texas Tribune polling of Texans’ approval of Obama suggest that constant criticism of the president is unlikely to trigger much backlash among moderates and even Democrats. GOP candidates have lots of latitude when piling on the president, implications of a public opinion landscape that is bad news for the Texas Democrats who recently have been so flush with optimism. Obama lost Texas resoundingly in both of his reelection campaigns — to John McCain by 11 percentage points in 2008 and to Mitt Romney by 16 points in 2012 — and it’s not surprising that his approval numbers in Texas have never been stellar. This is a red state, and except for a singular instance in our February 2009 UT/TT poll — right after Obama assumed office —Texans’ disapproval of his job performance has outweighed approval in the remaining 15 polls between then and October 2013. 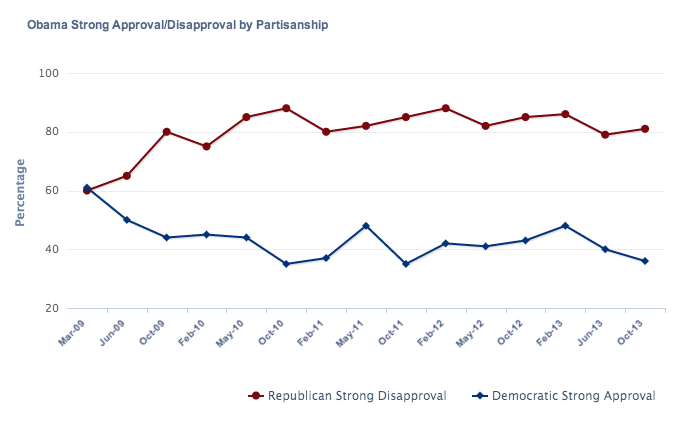 Public opinion toward the president favors the Republicans and hurts the Democrats heading into 2014. In the UT/TT Poll, we somewhat uniquely ask respondents whether they only “somewhat” or “strongly” approve or disapprove of the job performance of a particular officeholder. This is in contrast with most pollsters, who just ask a straight approve/disapprove question. The advantage of our format is that we can measure intensity of opinion — and changes in that intensity over time. Texas Republicans have long held Obama in low regard, with at least 80 percent of GOP identifiers strongly disapproving of the his job performance since May 2010. The Obamas hadn’t quite finished redecorating the White House when Texas GOP candidates up and down the ballot started running against him as much as their opponents. By the time the 2010 general election rolled around, Gov. Rick Perry was doing everything he could to saddle Democratic challenger Bill White with Obama, and even Republican state legislative candidates were using the president in their ads. (For a reminder of what this was like, review this classic spot, which Republican Patrick McGuinness used — unsuccessfully — to gain ground against Democratic incumbent Mark Strama, D-Austin.) Obama’s unpopularity was no surprise at the time and is surely part of the reason so many Republican hopefuls still deride Obama as proof of their conservative credentials. The repetitive pounding on Obama is partially enabled by the fact that the president doesn’t enjoy symmetrical support among his own partisans. Strong approval among Democrats has slid throughout his presidency — not an unusual occurrence when early hope and promise hit cold, hard political realities (just ask George W. Bush) — with slight upticks during his successful re-election campaign and after the killing of Osama bin Laden. 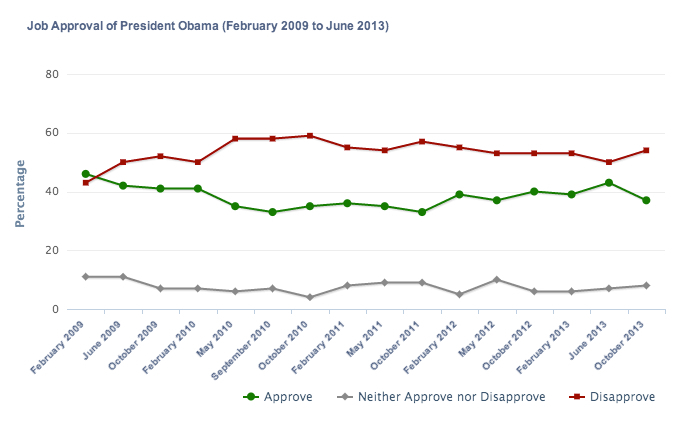 Obama’s strong approval among Democrats now rests at a near low of 36 percent. In addition to this lack of intensity among his supporters here in Texas, it’s also the case that in October 2013, nearly a quarter of Democrats indicated either a neutral view of the president (that is, neither approval nor disapproval), or a negative perception — a low-water mark for his presidency. But maybe most importantly when looking ahead to the 2014 races, 42 percent of Texas moderates held a negative opinion of his job performance in October 2013, the largest share holding a negative opinion during his time in office. Democrats and moderates have been consistently kind to the president; more than 50 percent expressed approval of his job performance in 11 of the 16 UT/TT polls since February 2009. If moderates have soured on the president, there is little disincentive for GOP candidates to continue with their primary season Obama bashing during the fall. That includes anchoring an ascendant state Sen. Wendy Davis, the Fort Worth Democrat running for governor, to a sinking president. Democratic hopes of capturing any statewide office in 2014 rest in no small part on bucking the trend of the president’s party losing ground in midterm elections. The magnitude of that lost ground tends to be foreshadowed by presidential approval numbers. Obama is still the figurehead of his party, a fact that no Republican officeholder, or potential officeholder, is likely to let the electorate forget. Amid all the speculation about whether Democrats can turn the tide, Obama’s approval numbers are creating a rip current likely to push Democratic hopes farther out to sea — while back on shore, the lifeguards all seem to have disappeared.